When we bought this house, we were aware that it had two single garage doors (instead of a double) but never thought much about it… until we tried to pull a van into it! This is what it looks like when I’m trying to pull the van into the garage. There is exactly 7 inches of clearance total or 3.5 inches on each side. Remember those cone exams when you took your driving test? Remember how stressful it was? I get to do that every day! 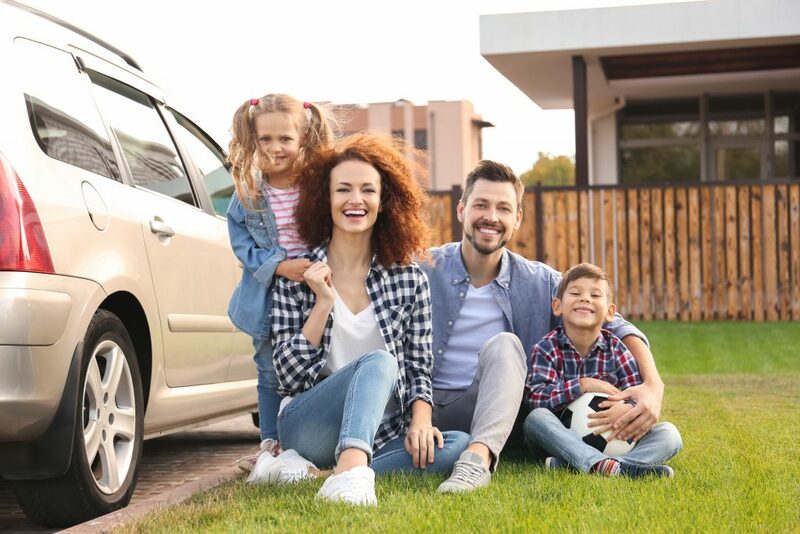 Since there is a structural support beam in the center of our garage, there’s nothing we can do to change the situation (without costly structural changes to the house). Imagine this scene… I’m running late. I buckled the kids into their car seats as quickly as I could. Someone starts screaming about wanting a snack. I start pulling out of the garage and SCRAAAAAPE, I hear the side of the van scrape on the garage. Have you ever gotten a paint transfer scuff on your car from rubbing it against something? It’s no fun! 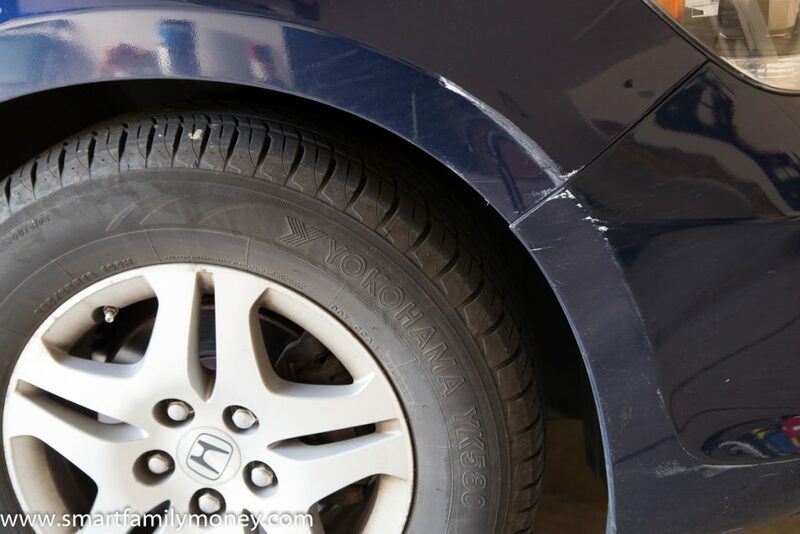 What Are Paint Transfer Scuffs? Paint transfer is the term used when paint from another object (or car) transfers onto your car’s paint. 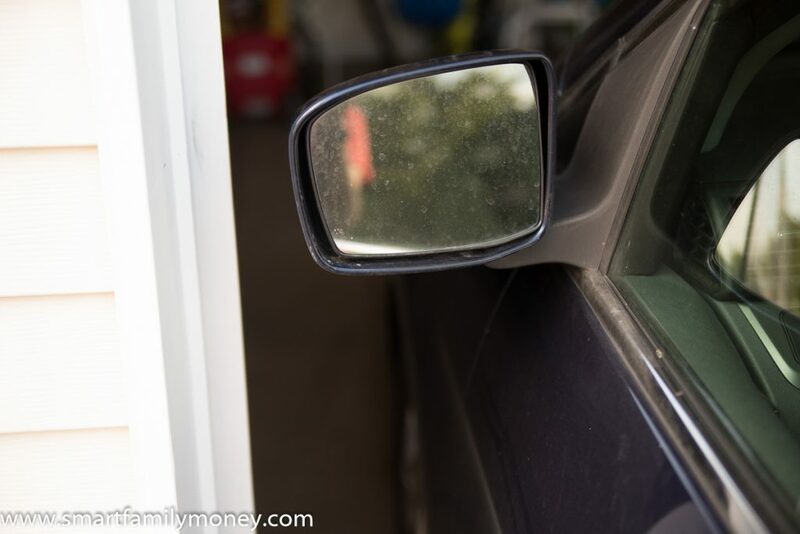 This can happen when another car’s door is bumped into yours or when you scrape your car against something like a parking bumper, pole, or a garage. The bad news is that I know way too much about paint transfer scuffs. The good news is that I get to share what I learned about removing those paint transfer scuffs with you! 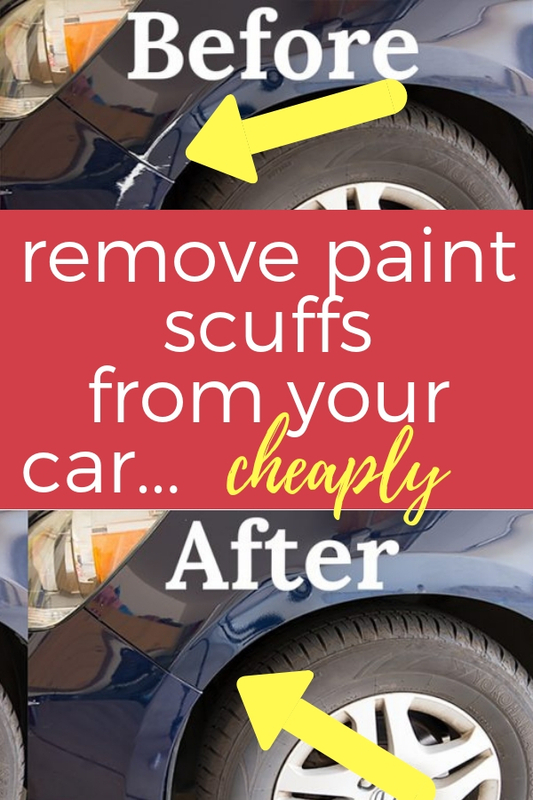 It’s shockingly cheap and easy to remove those ugly scuffs. Currently, on the driver’s side, we had a large amount of white paint transfer, as well as a small dent. The passenger side also has some paint transfer with a scrape that goes deeper into my car’s paint. 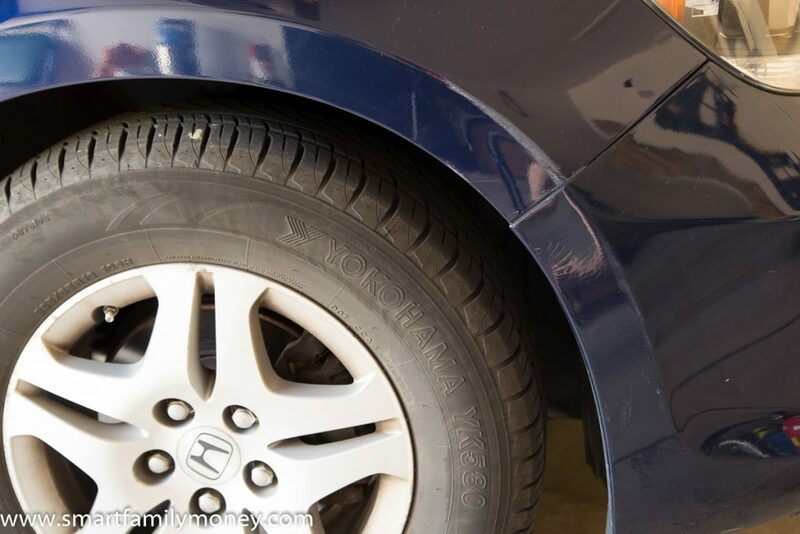 Paint transfer scuffs on the passenger’s side with a deeper scrape. There are a variety of commercial auto buffing compounds that you can purchase, but I wanted to see if I could use a cheap and easy method first. I had heard that toothpaste can work on paint transfers because all kinds of toothpaste are mildly abrasive. Whitening toothpaste is usually recommended for these kinds of jobs because it is slightly more abrasive than regular toothpaste (that’s how it whitens your teeth!). I dug around in my basket of toiletry samples that I keep around for guests or traveling and found two kinds of toothpaste: regular Crest and Aquafresh “extreme clean whitening”. I grabbed an old rag towel and got to work! My supplies: toothpaste and a rag. Moisten the rag so it’s a bit damp. Put a small dab of toothpaste onto the rag. 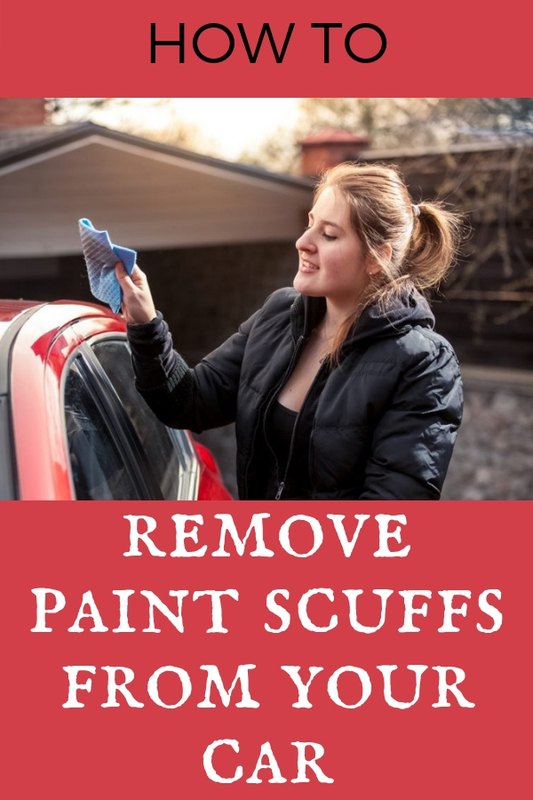 Scrub the paint transfer scuff. You have to put a bit of muscle into it! 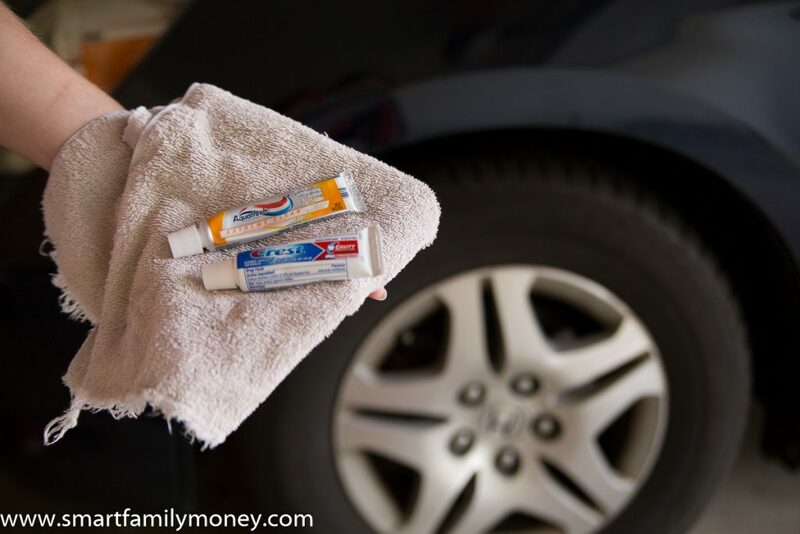 When the paint scuff is gone, wipe off the toothpaste with a clean, wet rag. That’s it! It only took 5-10 minutes per side and it made a HUGE improvement! I did find that the whitening toothpaste worked better than the non-whitening. If you only have regular around, though, it can still work. It might just take a bit longer. As you can see, they’re still not perfect because there is a dent and a deeper scratch still remaining. I’m much happier with how it looks now, though. Most people wouldn’t be taking close-up pictures of my old van and aren’t going to see these minor imperfections. I may try some home solutions for popping out the dent, but it’s a tricky one because of the location and curve of the metal. I am very happy with the results! My old van is looking much nicer now. Knowing how to remove paint transfer scuffs won’t prevent me from doing it again, but at least I know how to fix the problem! 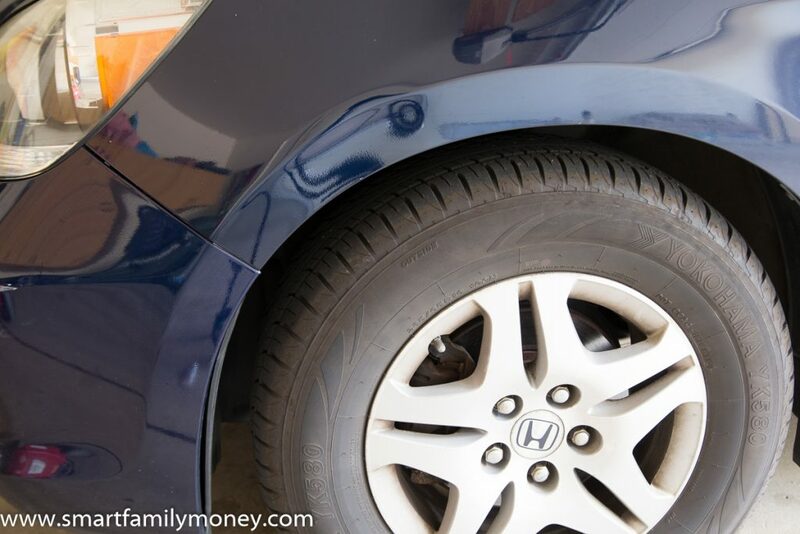 Do you have any paint transfer scuffs on your car that could use the toothpaste treatment? Please comment below. How do you get the paint off your garage wall after you fix the car? My car paint doesn’t rub off on the garage for some reason! Sorry I don’t have a suggestion for that one. This was awesome! We removed a 4-5 foot (no joke) paint rub off my friend’s car in 15-20 minutes. Never had to tell the husband we flirted with another car! That’s so awesome! Glad it worked for you! My daughter had just passed her test and had a scrape in Sainsbury car park! Paint scuffs on her bumper. She felt awful, her fist little car told everyone she had a prang. I am so glad it worked for you! Thanks for commenting! Will this trick still work if the scuffs have been on the car for a long time? or does it only work on fresh scuffs? My scuffs were old and it worked for me! Good luck! Parked in multi storey car park today, after arriving home found white paint mark running along front and rear doors and side wing (a big white car was parked next to mine). Found your tip and tried, used Oral B, after bit of elbow grease paint all gone, lucky cant see any dents. Thank you for your tip. Why do people get big cars when they cannot park them without damaging other peoples cars! I am sorry that happened to you but so glad you were able to take care of it! Thanks for commenting! Decided to splurge and rented a bmw 700 series on vacation in California. Some guy on a bicycle plowed right into us last night! Don’t think there’s a dent in the car, just paint transfer. Going to try the toothpaste bit now—hopefully we can return the car without a scratch on it!! I actually grind the wall while driving up the car parking lot. The back passnger door’s paint is chipped and there’s scuffs as well. Will this technique just remove the scuff? I want to get rid of the scuffs first. It definitely will not help chips. If the scuff is from some other kind of paint on top of the car paint, this will work. If the scuff is from the car’s paint being removed, it will not work. It sounds like it is worth a try to see what happens though. Good luck! Glad that it mostly worked for you! Thank you for this! I wish I had take a before and after of the HUGE white transfer on our red car. It’s almost completely gone with the exception of a few spots that obviously were scraped.